On this date in 1939, two weeks after Ger­man troops entered Prague and all of Czecho­slo­va­kia fell under the Ger­man boot, the Brit­ish govern­ment, followed a few days later by the French, pledged to guar­an­tee the inde­pen­dence (though inter­estingly not the terri­torial integ­rity) of Poland. A week later the three states an­nounced a for­mal alli­ance when Polish Foreign Minister Józef Beck visited London. That the West­ern demo­cra­cies would guar­an­tee Poland’s inde­pen­dence so en­raged Adolf Hitler that he told commanders of his Wehr­macht (German armed forces) to begin stra­tegic plan­ning for Fall Weiss (Oper­a­tion White), the de­struc­tion of Poland, with a pro­vi­sional start date of Septem­ber 1, 1939. A defeated Poland would elim­i­nate the “Free City of Dan­zig” (German, Freie Stadt Dan­zig), con­sisting of the Bal­tic sea­port of Dan­zig (today’s Gdańsk) and sur­rounding areas, which were roughly 95 per­cent ethnic Ger­man. This geo­graphi­cal oddity of the 1919 Ver­sailles Peace Treaty was admin­is­tered by a League of Nations high com­mis­sioner (at the time, a Swiss), and most Germans found Dan­zig’s exis­tence a vexa­tion because it and the so-called Polish Corri­dor split East Prus­sia from West Prus­sia and the rest of Nazi Ger­many (see map). Ger­man units were to in­vade Poland from three direc­tions: the main attack from Ger­many across the west­ern Polish border, a second route from the East Prus­sian en­clave, and a third attack by Ger­man and allied Slo­vak units from the Czech puppet state (since March 14, 1939) of Slo­va­kia. All three assaults were to con­verge on War­saw, the Polish capital. Fall Weiss was the first Euro­pean mili­tary oper­a­tion of World War II. It would be six years of bru­tal occu­pa­tion and the death of four mil­lion Polish civil­ians, three-quarters of them Jews who died in con­cen­tra­tion camps or gas cham­bers, before the last units of the Wehr­macht were swept from Polish soil. As for Dan­zig itself, many of its resi­dents perished or fled west­ward ahead of the Soviet on­slaught and the city’s de­struc­tion and con­quest by the Red Army in March 1945. After the war most of the re­maining eth­nic Ger­mans were forcibly ex­pelled. The city was sub­se­quently placed under Polish admin­is­tra­tion by the Allied Pots­dam Agree­ment (August 1, 1945), and Poles from Cen­tral and Soviet-an­nexed East­ern Poland were brought in to replace the German population. 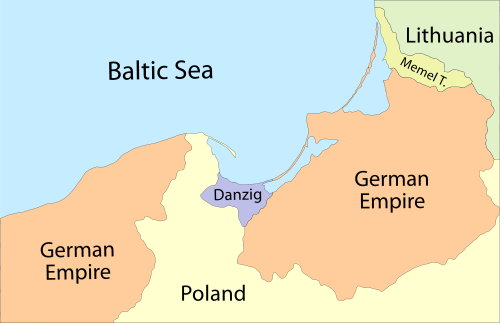 Above: Map of Danzig (“Free City of Dan­zig,” pre­sent-day Gdańsk) and Poland’s corri­dor to the Baltic Sea (“Polish Corri­dor”) squeezed be­tween Ger­man West and East Prus­sia on the eve of war, 1939. The Memel Terri­tory (today’s Kalinin­grad Oblast) was retrans­ferred by an in­tim­i­dated Lithu­ania to Nazi Ger­many on March 23, 1939. This event proved to be the last of a series of blood­less annex­a­tions of terri­tories sep­a­rated from Ger­many by the 1919 Treaty of Versailles. 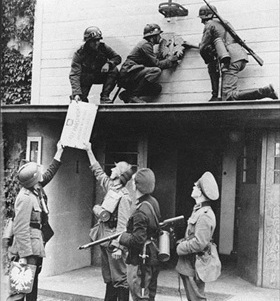 Left: German troops remove Polish insignia at the Polish-Danzig border near Sopot (German, Zoppot), September 1, 1939. 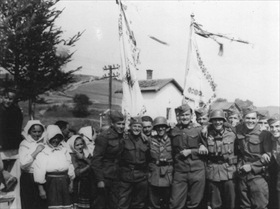 Right: German and Slovak soldiers pose with civilians in Komańcza, Southeastern Poland, September 1939. 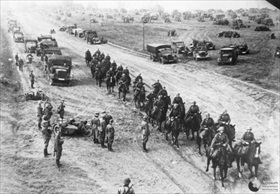 Left: German cavalry and motorized units enter Poland from East Prussia, 1939. 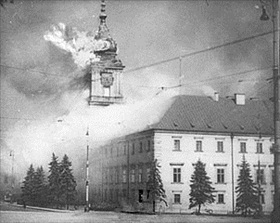 Right: The Polish Royal Castle in Warsaw on fire after being shelled by Germans, Septem­ber 17, 1939. On Septem­ber 26 German troops captured three key forts defending Warsaw and entered the capital the next day.